Martians, also known as Native Martians are a species from Mars and they live in the Martian Reservation, inside the Great Stone Face of Mars. They once owned the land and the Buggalo, but sold it to Sir Reginald Wong for a gigantic diamond which they assumed was a worthless bead. They tried to steal the Buggalo and get their land back, until they found out they hadn't been screwed over after all and the diamond made them exceptionally wealthy. After this realization, they left to find a new home, dismissing Mars as a dump. The Martians often protest that their ancestors' bones aren't treated with respect. Not much is known about the history of the Native Martians, although it is known that prior to their exchange of half of Mars for Sir Reginald Wong's bead, they had left a doomsday calendar on Earth as a warning to Earthlings for the destruction of Mars. After the purchase of their land, the natives were forced off their land and went to live in a reservation buried deep under the stone face of Mars. 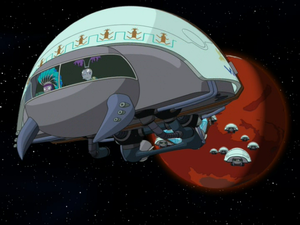 Over time, the natives' descendants grew resentful over the sale (which they considered illegitimate due to not knowing the true value of their bead) and, in acts of petty vengeance, plagued Mars with dust storms, and eventually went as far as to first steal the Wong's buggalo, then kidnap the heir of Wong Ranch. [3ACV10] During the negotiations, the truth about their "bead" was revealed and the chief, both delighted at their vast new wealth and satisfied with his ancestor's trade, took his tribe and left Mars. The Native Martians' current planet of residence is unknown. Despite this, some Martians can still be seen in Mars, most specifically within Mars Vegas. Can cause storms by throat-singing. Were able to predict the 3012 phenomenon, foretelling the destruction of Mars. They're based on Native Americans. Despite their apparent lack of technological sophistication (or understanding of modern intergalactic society), they possess a fleet of spacecrafts capable of spontaneous interstellar travel. They were also capable of space travel long ago, as they were the ones who left the Martian calendar and Martian stone spaceship on Earth in the first place. Singing Wind: I am Singing Wind, chief of the Martian Tribe. Zapp Brannigan: Take me to your leader. 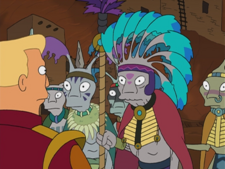 This Martian cries not because Zapp Brannigan litters a Slurm can, but because "Cynthia used to drink Slurm." This page was last edited on 21 July 2017, at 07:52.